We are currently planning a regular ‘Progress Report’ symposium to discuss cross-cuttings ideas and our Workgroups. This will initially be hosted in London. The symposium will feature two debates – both being central to the Manifesto themes – with a final plenary to gather overall feedback. Each debate will be introduced with a provocation made by a member of the Manifesto team. Two external speakers will challenge the points being made, with the remainder of the time given over to the audience, for a wider debate. In partnership with the R&D Society and in association with Epoch Despite its importance to our economic future, innovation has largely been overlooked since the credit crunch and is being largely ignored in the UK General Election. 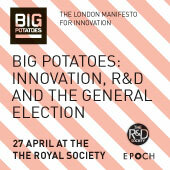 As a remedy, the R&D Society and the authors of BIG POTATOES: The London Manifesto for Innovation together organised an eve-of-election event. The speakers were Steven Cousins, Axon Automotive; Eliot Forster, Solace Pharmaceuticals; Norman Lewis, Open-Knowledge (and BIG POTATOES co-author); Munira Mirza, London Mayoral Advisor; Stefan Stern, Financial Times; and James Wilsdon, The Royal Society Science Policy Centre. The speakers’ comments and the discussion are summarised on the event page. The Big Potatoes manifesto is a profound contribution to the debate about the future of crisis-hit economies: in the short-term context of the UK election; the medium term of the stumbling global recovery from recession; and the long term of innovation and economic progress led by some of the old and new economies, including China and India. BIG POTATOES was previewed in the context of a talk by Professor James Woudhuysen.